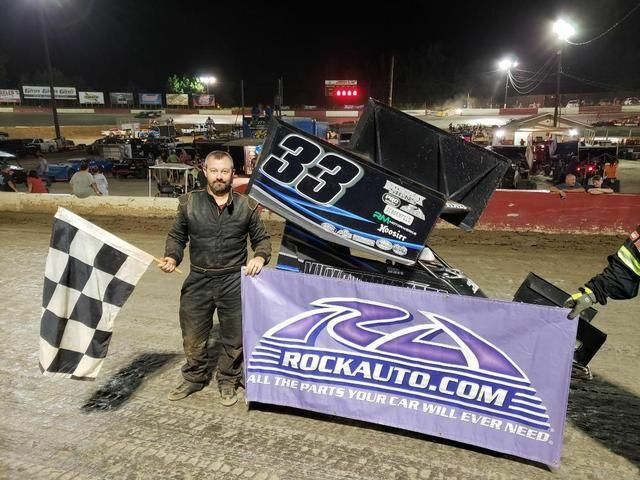 Senoia, GA - September 8, 2018 – www.RockAuto.com USCS 600 Sprint Car Series Rookie of the Year contender, Mike Hall from Knoxville, Tennessee scored a career-first trip to the www.RockAuto.com USCS Victory Lane as te 20-lap main event winner at Senoia Raceway on Saturday night during the USCS Senoia Summer Nationals IX. Hall, who is a former Late Model Dirt car racer, has a season full of top five finishes and great runs , but, finally put it together for a win around the 3/8 mile Gumbo clay oval at Senoia for his first win in the winged mini sprint cars. Hall bested another Rookie of the Year contender in 11-year-old mini sprint phenom Trynt Llloyd from Jacksonville, Florida who started eighth in the field to finish in the runner-up spot. Two-time series National Champion, Bobby Zaiontz, who won both the USCS Hoosier Speed Dash and the Engler Machine and Tool First Heat, claimed the final podium spot and the K&N Filters Award in third place. Jim Kradel from Navarre, Florida, who won the Brown and Miller Racing Solutions Second Heat, followed the trio in fourth place under the checkers and 2017 Rookie of the Year, Alex Lyles from Arlington, Tennessee rounded out the top five. Don R Quinn from Wesley Chapel, Florida led the next group in sixth place. Jim McNulty from Navarre, Florida was seventh followed by Don T Quinn from Tampa, Florida in eighth place. Chase Garner from Tuscaloosa, Alabama finished ninth and Brad Sutton from Palmetto, Florida got credit for tenth place. The www.RockAuto.com USCS 600 Sprint Car Series presented by FireAde would like to gratefully thank its sponsoring partners for their involvement in the 2018 and 7th USCS Chained Lightning Tour: K&N Filters, www.rockauto.com, Hoosier Racing Tires, Engler Machine and Tool, Butlerbuilt, Wilwood Disc Brakes, Saldana Racing Products, DMI/Bulldog Rear Ends. PRO Shocks, DHR Suspensions, Schoenfeld Headers, Bell Helmets, Brown and Miller Racing Solutions, FireAde, FireAde Enforcer and Hero Graphics. The next www.RockAuto.com USCS 600 Sprint Car Series event will be the two-day USCS Fall Nationals at historic Riverside International Speedway inn West Memphis, Arkansas on Friday and Saturday, October 12th and 13th. For info on rules and schedules for the www.RockAuto.com USCS 600 Sprint Car Series presented by FireAde please visit www.uscsracing.com For daily updates please heck out the USCS Racing Facebook page.